2.2.1 What to Check When Buying a Surge Protector? 2.2.1.5 Where to Use this Surge Protector in UPS? 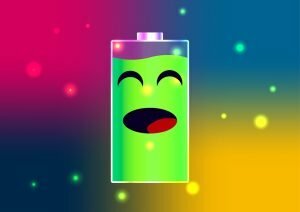 2.6 How to Choose a Battery Backup for a Computer? 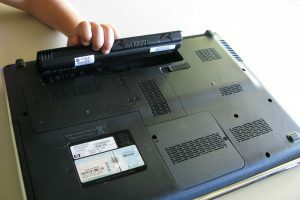 Do you know that your computer can be damaged if its power source does not work correctly? Battery backup power supply for a desktop computer hold the responsibilities of the power source in as the primary power source fails. 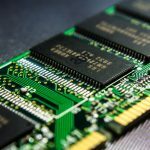 To save your computer from any significant damage, you must have a sound knowledge of its power sources and the entire system. 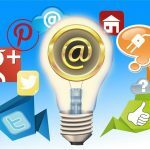 This article will let you know a lot more about it. It provides the power source to the hardware components of the computer in the case of any primary power source failure. You can plug different hardware components of your computer into the ups for power source when the power outage occurs. Mostly the computer’s main housing and monitors are plugged into this source. These UPS are available in different shapes and sizes. They are very much heavy. This massive weight is because UPS have batteries inside them. You can recharge them also. Replacement is possible quite easily. 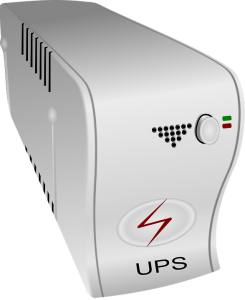 UPS can be switched on and off by a power switch. Moreover Led is also present that show how much it is charged. A surge protector is a device that limits the voltage supply to any device. It does this by grounding or by blocking the voltage that is not required. This device is also referred to a surge suppressor. Thus its primary job is to detect the excessive voltage. Then it diverts that excessive energy to the grounding wire. It saves your computer from getting the additional power that may cause damage. It has power strips to which it passes the voltage. If it finds the voltage higher, it moves that voltage to the grounding wires. In this way, your device remains safe from any damage by this high voltage. The protection that is offered may vary depending on different condition. Protection is offered in joules. Joule is the measuring unit. Some of the surge protectors also have a USB connection. In this way, you can get your cell phones charged by them. What to Check When Buying a Surge Protector? Thus for costly devices, you need a surge protector. You might be thinking how to know if a surge protector is suitable to buy. Following are some of the things to keep in mind while buying one. If it doesn’t have an indicator light then how will you know that your surge protector is working well or not? So you must check this thing before buying it. It is the voltage after which the excessive voltage is redirected. Thus a voltage below 400 volts is a good one. The high the energy surge protector can absorb higher will be its lifespan. Try to buy the one with joule rating of not less than 600. The faster this time is, the earlier it will detect the excessive electricity in your device. So try to buy the one with the response time of almost one nanosecond. The one with a faster response time than this would be an ideal one. Other factors to check while buying it include the warranty and product detail. Where to Use this Surge Protector in UPS? The answer to this question is the bypass line. You must install it on the bypass line. In this way, you will get two benefits. 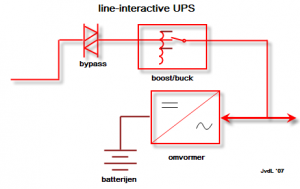 If the UPS gets offline, it will protect against the excessive voltage. Thus it protects the ups. In this way, it saves many devices. This 4-hour backup means that it will provide support to your device for almost four hours in case of failure of the primary voltage source of your PC. The difference between the two is that the surge protector protects your devices from excessive voltage while the other one gives protection in both the case, i.e., insufficient energy and excessive voltage. This device is handy to keep your PC functional in case of any sudden power loss. You don’t need any expert technical support in doing so. You can do this very quickly you will just need to follow some simple steps for doing so. Get the old one out. But before removing its connections note down the links. So that you may not get any difficulty in removing it with the new one. Also, check whether the new and old batteries are of the same size or not. Otherwise, you may get difficulty in replacing it. Then connect the new one with the ups. The maximum power factor is 0.8. Here the load is expressed in watt. Here AH refers to the battery’s ampere-hour capacity. The inverter performance is related to the battery. You may have noticed one thing that we haven’t used the inverter capacity in this entire formula. This nonusage is because the backup time is not dependent on it. Do you think it is difficult to understand? Ok, no issue. I will explain it to you by an example. Thus the time we have got is 5.9 hours. How to Choose a Battery Backup for a Computer? This market is quite broad. Therefore you must know what things you should keep in mind while buying one. This task is not so much trying. You can quickly get a good one if you have some knowledge about them. Check the amount of wattage. Check the runtime. This runtime refers to the time length for a time the ups will act as a backup source to your PC in case of primary power source failure. Check about the battery failure. Here thing you need to check is that is that if the battery goes down then whether the ups will operate till the replacement of this battery or not. The ups will work as a surge protector in this case (when its battery goes down). Check the cost of replacement. There are different types of UPS. Each has its features for which it is famous. The most common ones are listed below. This type of up is best for providing reliability to your home PC. It uses AVR. AVR refers to automatic voltage regulation. It first checks for the low voltage, and when detected a low voltage, it boosts that voltage. 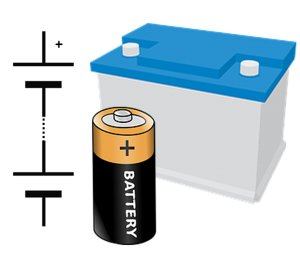 The primary power source is AC power line while the battery serves the secondary one. The inverter performs the function of charging the battery. 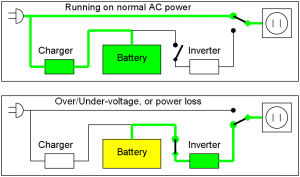 The inverter is in connection with the output of ups and is always on. This inverter connection is considered as the most prominent benefit of this type of ups. It is named as standby because here the inverter comes into action in case of power failure only, i.e., they are in standby mode until they are not in use. The battery is charged using the line power. Its one disadvantage is that in the case of power failure the switching to ups occurs with a little bit delay, i.e., switching to UPS doesn’t happen immediately in case of power outage. This time is referred to as switch time. The inverter supplies the load voltage. It offers a reduction in energy loss. It consists of a delta inverter which performs the function of charging the ups battery and regulating the input power. In this type, the transformer is equipped with a Ferro resonant capability which performs the function of voltage regulation. It has a transformer with three windings. Windings are the power connections. AC input serves as the primary power supply source which makes its way through a transfer which the transformer and finally to the output. High reliability is one its main feature. Turn on the battery saver. This saver will save your laptop battery, and you will be able to use it for a longer time. Close all necessary apps running in the background to reduce power usage. 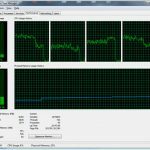 Task manager can be helpful for you in closing such background processes. Disconnect the unwanted devices from your laptop. Make sure you didn’t disconnect any critical device like hard drive or processor. You can do it quickly from the device manager settings in the control panel. More heating will shorten the battery life. Avoid using the laptop on a pillow or any other thing of the sort. The reason for this is that it increases the heat of the computer. Thus from the above discussion, the importance of surge protector and battery backup for the computer during a power outage is much clearer. They are essential in improving the lifespan of your computer. Voltage changes can severely affect your computer. Your PC needs it in case you want your PC to work for a more extended lifespan without any issue.